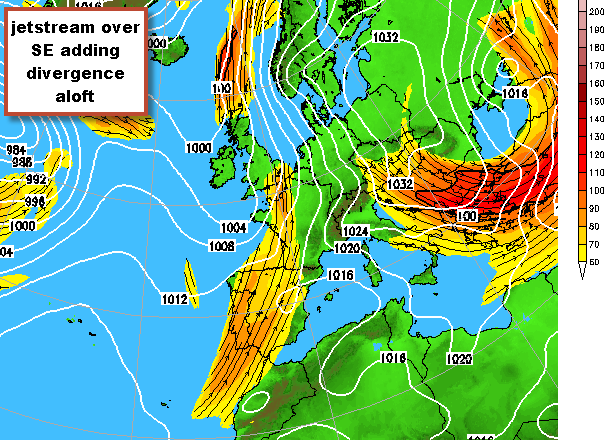 #Reigate most ingredients set to cook up a possible Thundery Thursday! Heavy rain alert and UKMO weather warning issued for Reigate and SE Thursday 3 Oct from afternoon and overnight through to small hours Friday. An unstable plume of warm moist air will edge across the SE during Thursday afternoon and bring the potential for heavy rain as fronts provide lift to the air to produce possible thunderstorms through Thursday pm and evening. Rainfall totals from showery outbursts will vary a lot locally, probably most further towards the south coast and further east, but could be as high as 20mm over the 24 hour period almost anywhere in S and SE corner during this time; most places will see a lot less, 6-10mm being widespread. Winds will be 15mph initially from the SE but in heavy showers gusts could reach 25mph. The wind will veer to the S overnight. It will be increasingly humid during the day with Tmax of up to 20c, staying rather warm overnight but cooler and much brighter on Friday at 17c as cooler polar air follows the cold fronts with a few showers lingering as fronts move away leaving a brighter showery day. warm air advection: which means a warm plume of air will be provided for several hours during Thursday pm but will be replaced by cooler air on Fri am. 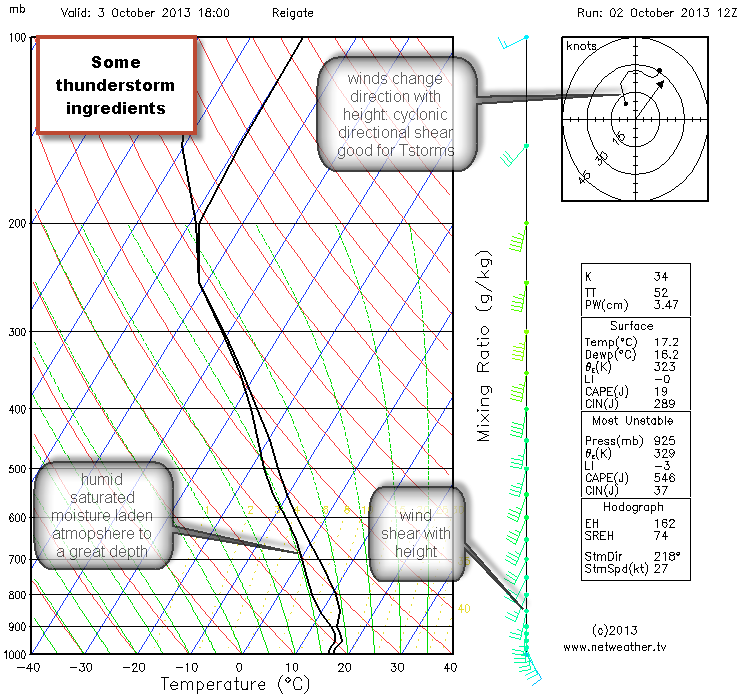 wind shear: winds at the surface will intially be SE but at height will be a brisk warm southerly. This change in direction and speed with height storms will not “stagnate” over ground they have just cooled with a soaking, so that thermal activity will be maintained with further warm air available to lift and grow bigger cumulonimbus clouds which roll through rapidly. On the other hand, high rainfall totals will be subdued as showers move over relatively quickly. Jetstream overhead (arriving later on Thursday evening) providing strong upper air divergence: this means air will be dragged off the surface as air rushes UPWARDS to fill the gap left by the rapidly disappearing air aloft. This convergence on the surface means rapid uplift… perfect for building thunderstorms! Some ingredients are missing or rather lackluster. The most obvious one is a lack of heating during the day. Thursday will be mostly cloudy and, being October, the heat from the sun will not provide as much buoyancy as in mid-summer. This is a critical ingredient for big thunderstorms. This episode is also short duration and a cold front will rapidly replace the warm humid plume with cooler polar air, increasingly less showery, during Friday.